The weekly Baker Hughes rig count showed a second consecutive week of increased rigs in the U.S., rising by 18 to 917. In the Haynesville Shale region (which includes some other fields), the rig count decreased by four (-2 N.LA, -2 E.TX) to 124. This week's increase came in oil rigs (+23), while gas rigs were down by five. Since September 1, 2008, the number of oil rigs has decreased to 219 (-197 rigs, -47%) and the number of gas rigs has decreased to 687 (-919, -58%). 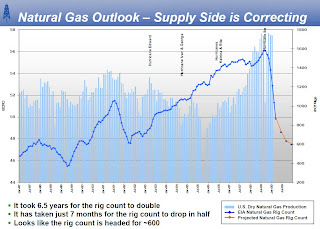 I recently read a presentation by Range Resources, a big name in the Barnett and Marcellus Shales, that spends a fair amount of time talking about natgas prices. Range thinks the rig count might drop as low as 600. They believe that the rig count won't rebound until natgas prices hit $7 to $8 per MMcf, which they consider the "marginal cost of development." But once the rigs go back to work, it will still take a year for production to stop declining because the base decline in the U.S. is about 30% per year, or 15 Bcf. I think this is an interesting analysis, but I'm not sure it takes into account the wells that have been drilled relatively recently but choked back to reduce flow or shut-in until prices increase. I have to believe there will be a surge of gas on the market once prices return to a palatable level, which will probably bump prices down again, at least for a short time. It likely will be a rocky road toward that equilibrium. On the subject of natgas prices, I saw an article on cnbc.com yesterday that noted that the ratio of prices between oil and natural gas reached 18.55 yesterday, the highest it has been since July 1991. The average ratio since June 1990 is 9.26, but as the chart below shows, it is a very volatile relationship. Many people are counting on gas prices to rise to correct this ratio, but looking at this chart one can tell that the 9x ratio is simply an arithmetic mean and not a hard rule. We should expect that ratio to run all over the place. I have to believe that natgas prices will change (rebound?) based on fundamentals associated with gas, not directly because the ratio to the price of oil.